Hello all and welcome to the first Sonic HQ interview in a long time. Today I'll be talking with Ian "Potto" Flynn, founder of Bumbleking Comics. Ian's "Other-M" series of comics has taken the Archie characters we all know and love and presented them in a totally new and twisted light. His comic is enormously successful and has run for a total of 20 issues so far with many more on the way. In addition to that, he has recently turned his attention to the SegaSonic universe and his upcoming "Ultimate Sonic" series promises to provide quite a twist on the world of the games. Following the advice of many of his loyal readers, Ian has recently summoned up all his courage and applied for a job as a writer with Archie. SHQ: For those reading who have no clue what we're talking about, could you please introduce yourself and tell us a little bit about you. Ian Potto: Sure thing. I am Ian "Potto" Flynn, and I'm the writer and sometimes artist of Other-M. I've been a Sonic fan for the better part of a decade and have a goodly number of the games and a very large library of the Archie comics. I'm a 20-year-old sophomore at University of North Carolina - Greensboro, and I'm currently in love with the lovely and talented Aleah "Crazy Chameleon" Baker, who happens to be an SHQ staffer. SHQ: How did you first become interested in Sonic? Ian Potto: I don't fully remember. I think it was the combination of three things. 1) My mom was stead-fastly against videogames for awhile, and you know how you always want something more if you can't have it. Sonic, and especially the articles of Knuckles Chaotix, really made me want to play. Sonic was my introduction to the gaming world. 2) Back when I was reading Uncanny X-Men, I couldn't find the latest issue for one month. Granted, the place I was at sold books primarily, but they had a few shelves devoted to comics, though. On a whim, I picked up Sonic's Friendly Nemesis: Knuckles #1. 3) A friend of mine in high school gave me one of his issues of Sonic out of the blue. 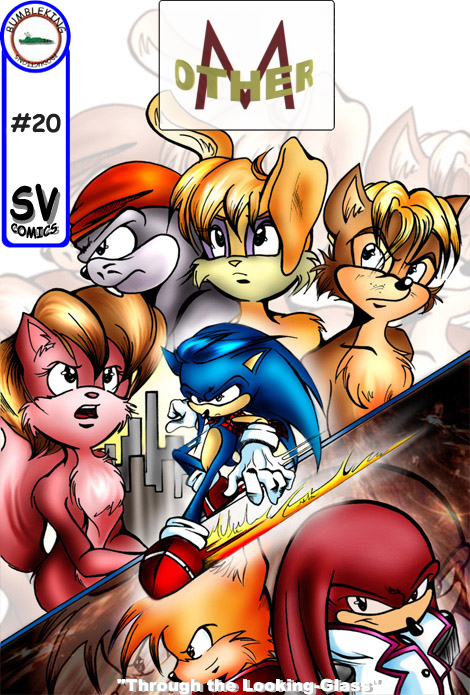 I forget the issue number, but it was the issue in which Sonic, Sally and Geoffery St. John braved the Zone of Silence and rescued King Acorn. That issue wasn't drawn all that well, and the story confused me no end, but I was hooked for some reason. Those three things all got me into the comic. Or, rather, Sonic in general. SHQ: Out of all the various versions of Sonic(both videogames and spinoffs), which is your favorite? Ian Potto: I've asked myself that alot, and I can't really decide, to be honest. I grew up on the SatAM/Archie Sonic, and I love the rich world and huge cast to work with. On the other hand, the SegaSonic world has a certain coolness to it that the other lacks. It's almost like comparing The Fellowship of the Ring and The Matrix - both are awesome in their own way. I also think the anime had potential in some areas, and what little I've seen of the Fleetway series I liked. The only version of Sonic I can say I definitively dislike is the early Adventures of Sonic the Hedgehog cartoon. The one with Scratch and Grounder. SHQ: Prior to your work with Other-M, did you do any other fan projects on the internet? Ian Potto: I did indeed. 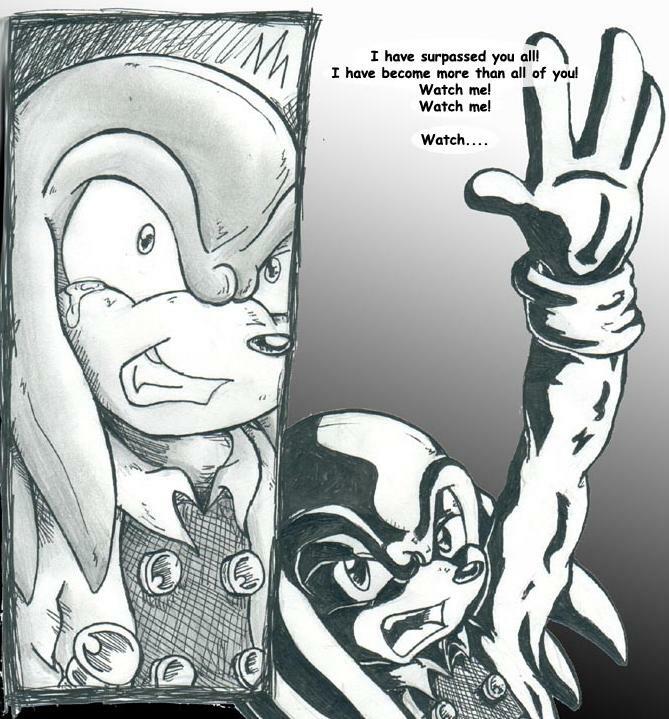 I was staffed on the fan-comic A Super Sonic Adventure. I submitted an improvised script as my application to Archie. It turned into the script for the first issue, and I went on to write issues #1-15. Sadlly, ASSA fell-through. I did some work on the ill-fated Sonic Hype as well. I've written a number of fan-fics (www.fanfiction.net - author name: Ian Potto). I was to provide some voice-work for the ill-fated fan-movie A Super Sonic Destiny, and I'm currently cast as the voice of Knuckles in the fan-movie by the SonicVerse Team...if that's still going. I honestly don't know. I'll have to ask Sonic Adventurer. I'm also the reviewer of Sonic :: Epilogue. SHQ: When and how did you first conceive the premise for Other-M? SHQ: How long did it take for you to turn your ideas into a solid product? Ian Potto: About a year. For about all of 1998, I worked on sketches, hunted for artists, and wrote scripts. I first tried to put out OM#1 on a GeoCities site, incomplete, with the badly colored pages it dons to this day. (One of these days, I'll got back through OM#1 and improve p1-5). After little to no reaction for a few months, I realized things weren't ready. So, I scrapped the site and spent the rest of the year writing and preparing. Other-M relaunched, complete, in May of 1999. It's been running for three long years since. SHQ: From the very beginning, you've used a staff of artists to draw the comic, rather than relying on any one person to pencil issues. What is your relationship with the artists who draw out your stories, and how much control do you have over what the finished product looks like? The way OM#1-30 are written leaves a good bit of control in the hands of the artists. They follow the directions I give in the script, but I allow them to choose the page-length and flow for the most part. My reasoning in that is that they're doing me this huge favor of drawing up my written work, so the least I can do is let them have a little creative control as an artist. Most of the time, I don't even need to send things back for corrections. 99% of the people I've worked with have been very professional. SHQ: From time to time, you yourself have been known to pick up a pencil and draw a few of the Other-M covers. How extensive are your artistic abilities, and what are your main artistic influences? Ian Potto: I don't hold my artistic skills in too high regard. I'm all right, but I'd rather leave the art to those of the higher caliber. Whenever you see me stepping in for art, that means either 1) I forgot to assign the cover and I'm doing it at the 11th hour or 2) the originally scheduled artist dropped out. I work in pencils with nominal inking abilities, and I'm still trying to tame the mighty beast that is Adobe Photoshop. When it comes to Sonic-art influences, it comes to be quite a list. My girlfriend, Chordsy, J. Axer, WB, Lady Laguna, Sasha, David Benjes, Spaz (until as of late), Art Mawhinney, Steve Bulter, Manny Galan...I'm sure I'm leaving out another dozen or so. I also greatly enjoy the photo-realistic work of the amazing Alex Ross and the insane detailing of Todd McFarlin. SHQ: One of Other-M's claims to fame is that barring any catastrophic emergencies; you've managed to crank out issues on a fairly regular basis. Has keeping up with this rigorous schedule ever proved difficult? Ian Potto: *laughs tiredly* You have no idea. Other-M #1, alone, went through four artists, three colorists, and two web sites. More often than not, the pages you read were finished and turned in within 24 hours of their posting. It's been crazy, hectic, and stressful more often than not. But the readers have been wonderfully patient, understanding, and supportive. Without them, I might've given up years ago. SHQ: Two of the characters of Other-M and your upcoming "3-B" series, Bean the duck and Bark the polar bear, are characters that many Sonic fans are unfamiliar with. For those who aren't familiar, they've only appeared in "Sonic: The Fighters" and a few isolated cameos in the Archie comic. How did you become so interested in these two reclusive characters? Ian Potto: Primarily because they were just that: reclusive. I searched the net high and low for all the data I could get. I found most of it on the Green Hill Zone, founded by Green Gibbon. Since Archie didn't follow up on them, and Sega wasn't either, it left tons of room to work with. They were an writer's dream. Bean, actually, has become my #1 favorite SegaSonic character. SHQ: Most of the characters in Other-M are parallels to characters in the Archie Sonic universe. Were all of these parallels immediately apparent when you began work, or did you have to stop and think "Now where should this guy go?"? Ian Potto: The main cast came to me fairly easily. Rotor left me scratching my head on occasion in the very beginning, but he's the exception. Once I extended the series beyond OM#20, I had a bit of a time placing the other characters. For the most part, I think I have everyone in the Archie Sonicverse in place. You'll see most of them through the course of the normal issues, and then the Other-M Specials. SHQ: What's the story behind Other-M's original intended length and your decision to extend the series? Ian Potto: Well, when first writing Other-M, I wanted to be reasonable. At the time, no fan-comic had gotten much further than issue #1. Those that had were usually awful and thrown together, so they don't count. I thought that if I could get out twenty quality issues in a reasonable amount of time, I would've made my name in the fandom. Reaction to Other-M was so positive (and the fact I knew there'd be a heavy reaction to OM#20's ending) that I announced an extension to OM#25. That met with so much praise that I got too big from my britches and announced it going all the way to OM#100. I've since scaled back on those plans a bit. SHQ: How much of an influence does fan feedback have on the comic? Ian Potto: Tons. The fan-mail, the fan-art, and the activity on the forums are constant reminders that people are reading my work and enjoying it. As I said before, without the readers and their feedback, I wouldn't have done Other-M, much less the other two fan-comics. SHQ: Recently, you've begun work on two new comic series based in the SegaSonic universe. What convinced you to move out of the Archieverse into the world contrived from the games? Ian Potto: Well, I figured I'd done so much damage to the Archieverse, the SegaSonic crowd was feeling left out ;-) Seriously, though, I really wanted to work in the SegaSonicverse since I love it as much as the Archieverse. 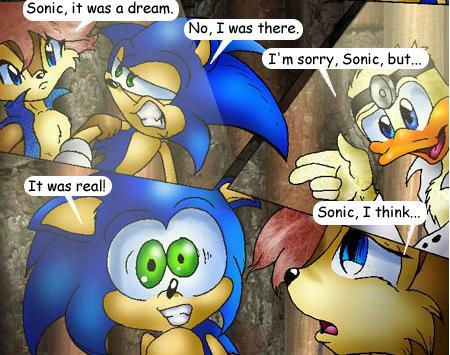 That birthed Ultimate Sonic, which I'm co-writing with Ian "Rat-Boy" Hamilton. 3-B was more on a whim in the late night ramblings I have with the Mage of Merford, who is co-writing that titles with me. SHQ: Some of these new upcoming projects you're co-writing with other people. What's it like writing something collaboratively as proposed to on your own? Ian Potto: It's an interesting experience. I felt I needed to learn how to work with other people, rather than controlling everything. Rat-Boy is a pleasure to work with on Ultimate Sonic. He's come up with pages of stuff that's blown me away. I never would've thought of some of the things he comes up with. Mager is equally brilliant. I can't count the number of nights he's left me howling with laughter at the keyboard. I may be good, but these guys are too, and our combined power will topple mountains! ....or at least make two more interesting reads. SHQ: Over the summer you debuted a new hilarious humor column (I don't know what else to call it) called "Ask The 3-B's". Was writing something so incredibly different from your previous projects a challenge? Ian Potto: Not at all. The secret to it was Rat-Boy, Mager and I would all get together on AIM when we could and just improv replies. We didn't take on individual characters - we just threw things out at random. Recently, scheduling has been difficult, however, so Mager took it upon himself to answer the growing back-log, which I'll update soon. I've read his answers, and they're as golden as the rest of the sessions. SHQ: When did you first get the idea of writing for Archie comics? Ian Potto: That's been riding my mind for at least a year now. On occasion, when someone would complain about the latest issue, I'd offer my opinion on what they should do. Every time, I've received these extremely enthusiastic replies that always end with "You should write for Archie!" So, this time, I finally up and applied. It's been about a month without any reply, but I'm hoping a continues stream of support email and snail mail will push things in my favor. SHQ: What would you say your greatest inspiration has been to keep Other-M and Bumbleking Productions going? SHQ: Any advice for those starting off with their own fan-comics? Ian Potto: Take time to prepare. Other-M nearly went the same way as most fan-comics because I pushed it too hard. In my humble opinion, you need at least ten scripts finished and three issues under production by the artist(s) before you should even think of advertising. That, and don't be discouraged. If you put out a good story, people will come to it. And never be afraid to ask an artist to draw for you. At worst, they'll say no, and even then they'll probably say it in a friendly way. Favorite Films: Shoo...so many. Animation-wise: An American Tale, Princess Mononoke, Cowboy Bebop: Knockin' on Heaven's Door, Treasure Planet. Then there's Star Wars (original trilogy - the latest two have been weak) the current Lord of the Rings trilogy, Jurassic Park, The Matrix trilogy, the original Batman movie, X-Men, Spider-Man, Much Ado About Nothing, the most recent rendition of Hamlet...and probably many others I can't think off immediately. Favorite Singers And Music: All-time fav. is a capella music, and the best I know of is Rockapella (yes, those guys from Where in the World is Carmen Sandiego?) Definitely check their site out: www.rockapella.com. Others I like are Creed, Smash Mouth, Bare Naked Ladies, Green Day, and Sugar Ray. I like just about anything, barring rap or country. Favorite Books: I highly recommend Stephen King's Dark Tower Series: The Gunslinger, The Drawing of the Three, Wastelands, and Wizard and Glass. Book five is on the way. To indicate how powerful that series is: I can't read Book IV again. I start to cry half-way in. Also, his 'Salem's Lot, Eyes of the Dragon, and The Stand are all gems. Orson Scott Card's Alvin Maker series, Ender Saga and the mirror series of the Bean Saga are must-reads. I forget the author, but the children's book Maniac McGee is perhaps the best book ever written. Comic-wise, anything Marvel Comics puts out under the Ultimate heading is golden. SHQ: Any final messages for the Sonic Internet community? SHQ: Thanks for the chance to talk Ian, and best of luck in your pending application.